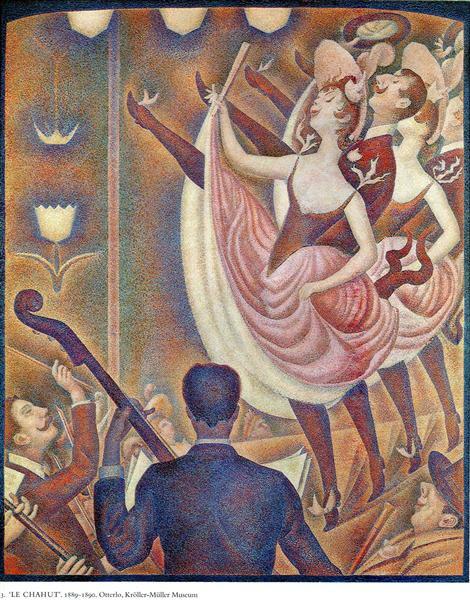 Parade de cirque (English: Circus Sideshow) is a 1887-88 Neo-Impressionist painting by Georges Seurat. 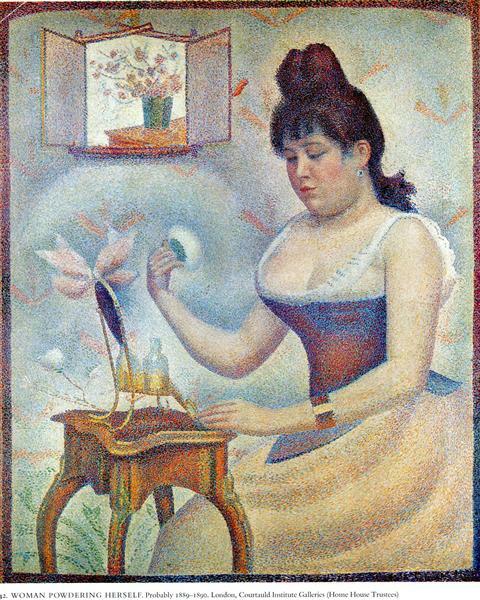 It was first exhibited at the 1888 Salon de la Société des Artistes Indépendants (titled Parade de cirque, cat. no. 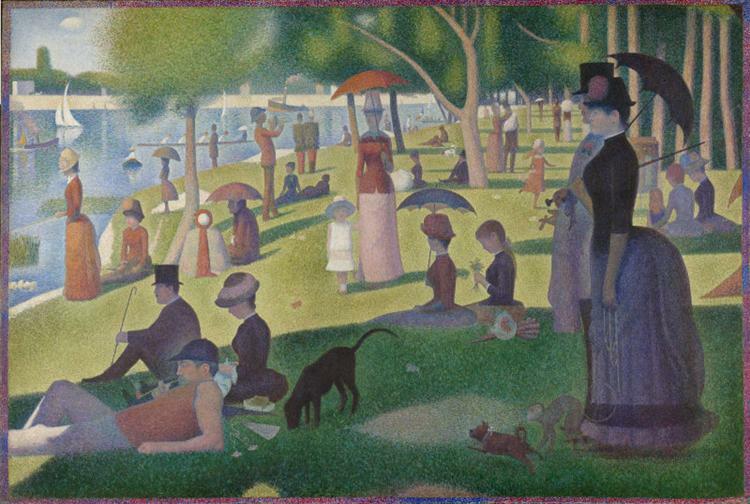 614) in Paris, where it became one of Seurat's least admired works. 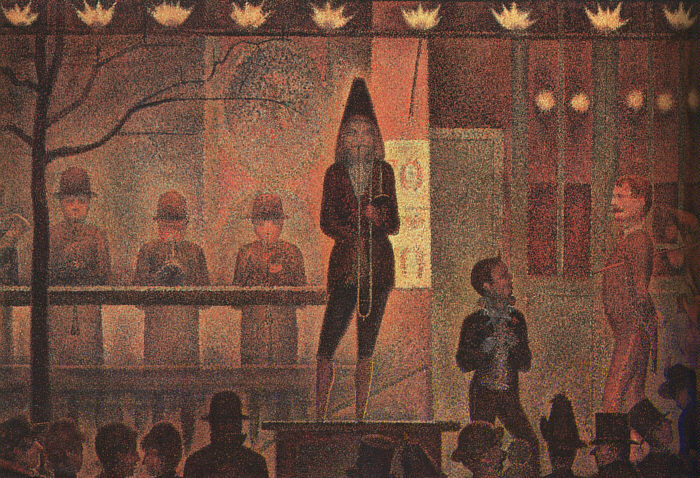 Parade de cirque represents the sideshow (or parade) of the Circus Corvi at place de la Nation, and was his first depiction of a nocturnal scene, and first painting of popular entertainment. 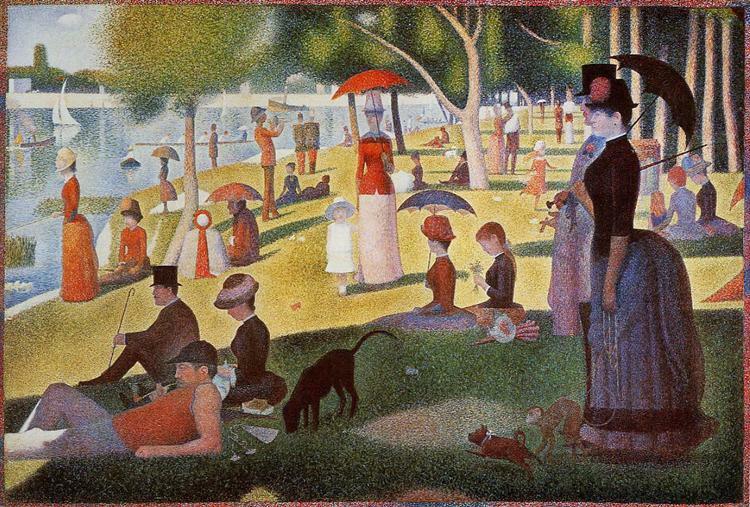 Seurat worked on the theme for nearly six years before completing the final painting. 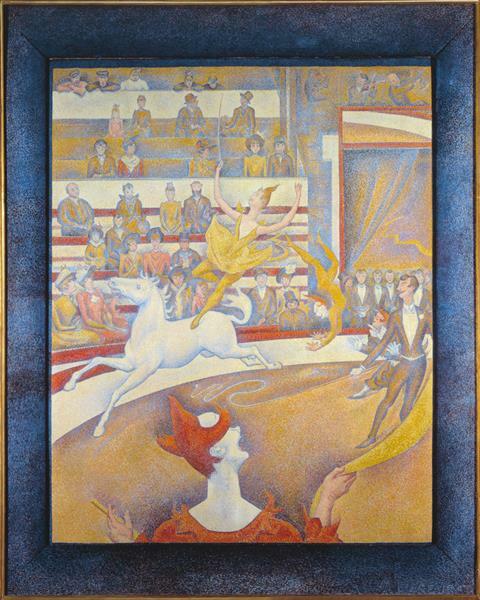 Art historian Alfred H. Barr Jr. described Parade de cirque as one of Seurat's most important paintings, its 'formality' and 'symmetry' as highly innovative, and placed it as "the most geometric in design as well as the most mysterious in sentiment" of Seurat's major canvases. Circus Sideshow influenced the Fauves, Cubists, Futurists and Orphists. It is located at the Metropolitan Museum of Art in New York (Bequest of Stephen C. Clark, 1960, accession number: 61.101.17, Gallery 826). Circus Sideshow is a large oil painting on canvas measuring 99.7 × 149.9 centimetres (39.3 × 59.0 in). 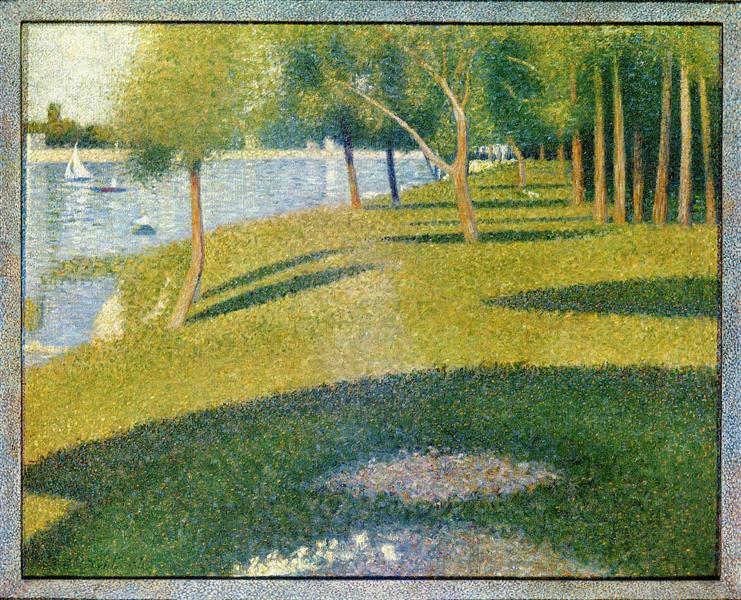 Painted in the Divisionist style, the work employs pointillist dots of color (primarily violet-gray, blue-gray, orange, and green) and a play of lines governed by rules whose laws Seurat had studied. It depicts immobile figures outdoors under artificial lighting at the sideshow of the Circus Corvi at place de la Nation, a working-class quarter in eastern Paris. A row of cornet and trombone players in solemn formation are seen under the unreal evening lights of a parade. The work is dominated by a monotony of horizontal and vertical lines, suggesting the rhythms of Egyptian reliefs and frescoes. 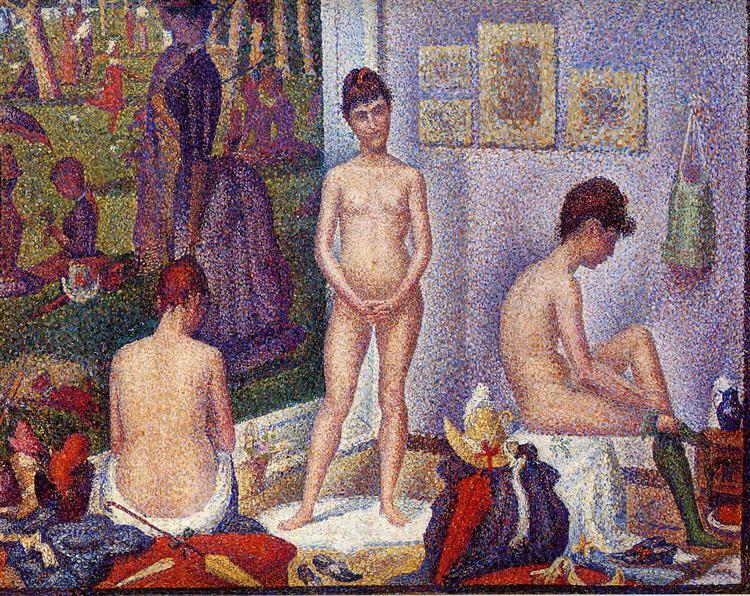 Though rather than indicating distance as Egyptian art (by changing scale), or classically (by foreshortening), Seurat establishes the position of his subjects through lighting. Those in the foreground are unlit, painted in dark blue, while those behind the gas jets are brilliantly lit. 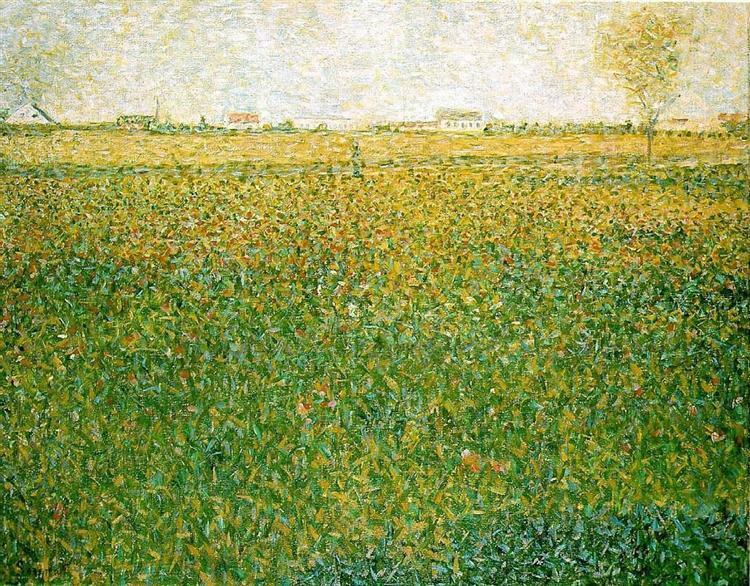 Seurat's view of this scene is so radically flattened that it is difficult to identify the composition's multiple levels. 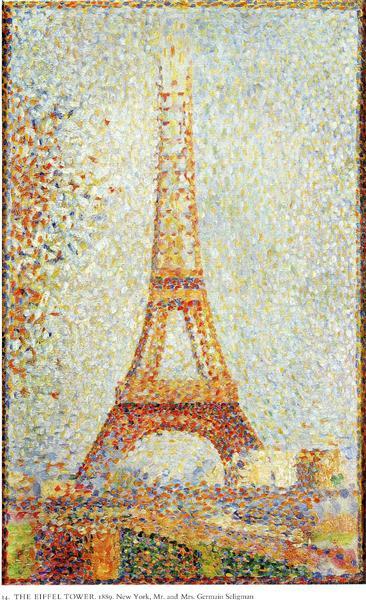 The golden section appears to govern its geometric structure, though modern consensus among art historians is that Seurat never used this divine proportion in his work. The final study of Parade, executed prior to the oil on canvas, is divided horizontally into fourths and vertically into sixths. The 4 : 6 ratio corresponds to the dimensions of the canvas, which is one and one-half times wider than its vertical dimension. 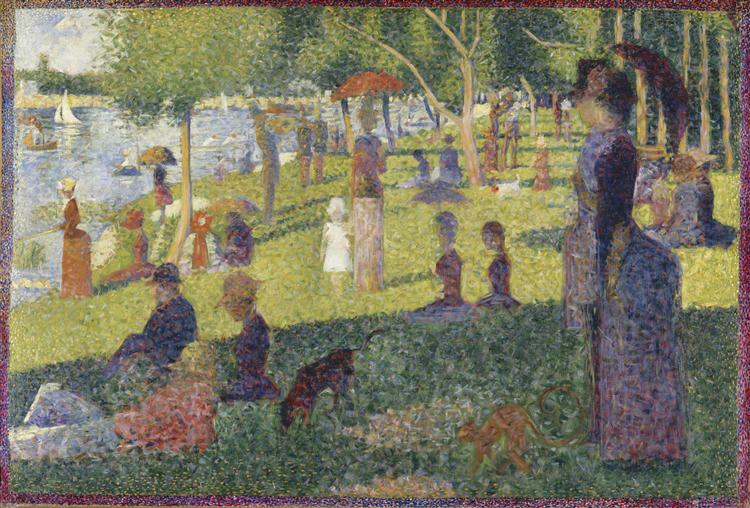 An additional vertical axes was drawn by Seurat, which neither corresponds to the location of the figures, nor to the architectural construction of the work; neither do these axes correspond precisely to the golden section, 1 : 1.6, as might have been expected. Rather, they correspond to basic mathematical divisions (simple ratios that appear to approximate the golden section), as noted by Seurat with citations from Charles Henry. The entrance of the circus tent consists of ticket window and doors at the center of a platform atop six steps. On both sides of the doors (here painted green), musicians and acrobats perform a sideshow on the balustraded platform to entice passersby. Those interested in purchasing tickets from the ticket seller—the man and woman toward the bottom right of the painting—climb the central stairs. Ticket holders queue parallel to the sideshow stage. The diagonal line behind the trombonist is the handrail for the subsidiary stairs. A woman with a young girl is buying a ticket on the platform to the right of the ringmaster. Just as the musicians toward the left, they are immersed in the orange glow of nine gas jets (each possessing a perceptible blue-violet aura) that illuminate the platform. Five yellow-white globes of interior lamps are visible through the ticket windows. The conspicuous tree to the left bares the presence of a human figure.